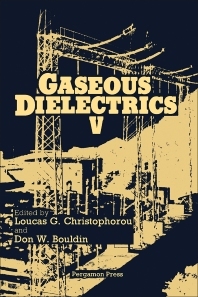 Gaseous Dielectrics V presents the proceedings of the Fifth International Symposium on Gaseous Dielectrics, held in Knoxville, Tennessee on May 3–7, 1987. This book discusses the effective coupling between basic and applied research and technology achieved in this area. Organized into 12 chapters, this book begins with an overview of the status of theoretical calculations of excitation and ionization coefficients for electrons. This text then provides an extensive investigation into different phases of discharge development in electronegative gases. Other chapters consider the use of sulfur hexafluoride as a dielectric medium in rail systems and gas circuit breakers. This book reviews as well the primary requirements for a successful gas analysis program, with emphasis on measurement and interpretation methods. The final chapter deals with the progress in dielectric quality assurance of gas insulated substations (GIS), which has resulted from improved scientific knowledge of significant phenomena. This book is a valuable resource for electrical and electronics engineers.